As before, the need for speed can spawn art. 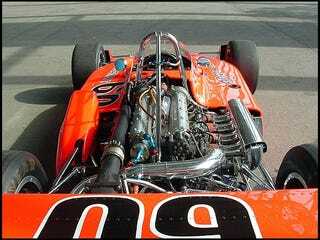 Offenhauser was based on 20's technology, but with a single one-piece block and head unit there wasn't a head gasket to blow so strapping on a great pumpkin turbo with unlimited boost regulations meant 1,000+hp and 44 psi of boost. Sometimes the need for speed generates unparallelled mechanical art. Elegant plumbing and installations, left unshrouded as installed in a Gurney Eagle look good. Boost reductions forced uncompetitive power (only 770 hp) and it failed to qualify in 1983, the last hurrah. Enter electronics and wiring and covered engines.